Archadeck of Central Georgia designed and built a new deck to replace an aging one, which was not only becoming unusable but did not provide the family with quite enough livable space. How much space will it take to bring this deck to the perfect size? You might be surprised! Many of our clients already have a deck, which is not providing for their needs, in one way or multiple ways. These Bonaire homeowners had an existing deck, which was becoming structurally unsound, but also was not providing this family with the space they needed. Their original deck measured ten feet out from the home. Ten feet is not necessarily small, but the issue is that ten feet is not a good, usable size. Not to worry! Archadeck of Central Georgia offered this family a new size that will better accommodate their needs – by only adding 2 feet to the depth. We always recommend a minimum size of 12 feet to accommodate outdoor furnishings. If you are thinking that your limited-size deck requires a super-size solution, you could be wrong! 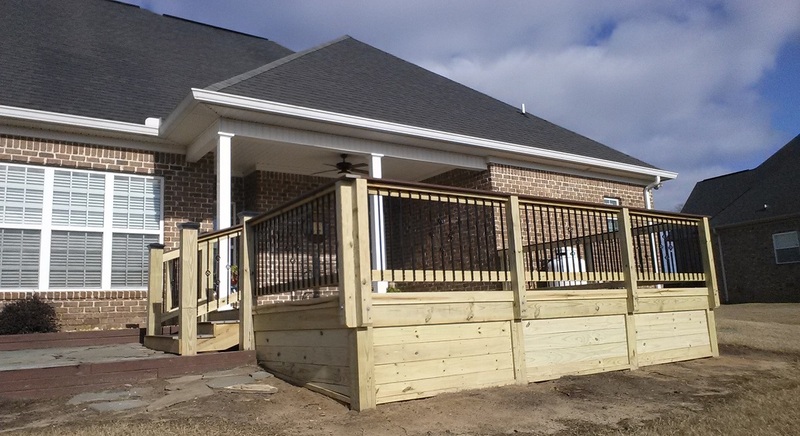 — By adding only two feet, we gave this family a more accommodating composite deck! 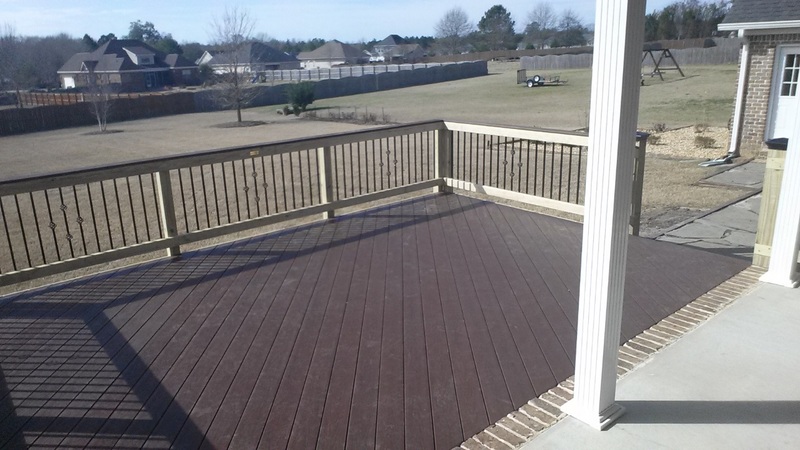 A larger, low-maintenance composite deck to the rescue! We built a beautiful TimberTech deck for this Bonaire family, in Caribbean Redwood, a great complementary finish to their home’s exterior masonry. We built a custom pressure-treated wood railing with decorative black metal pickets and topped the 6”x6” stair posts with black metal pyramid-shaped post caps. 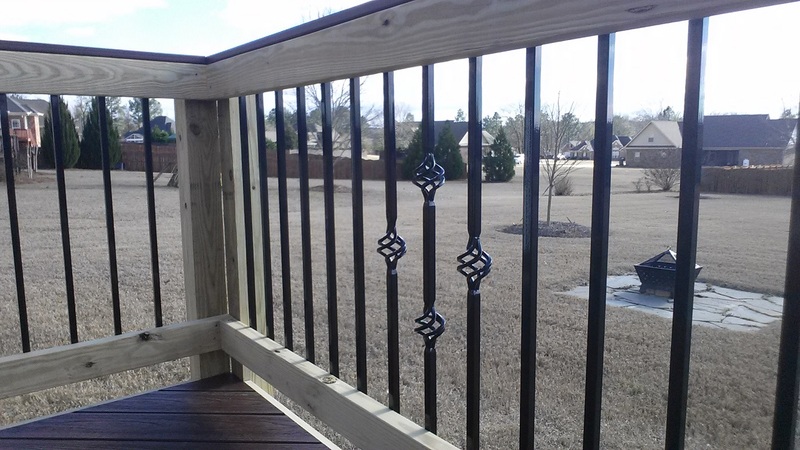 We used matching TimberTech top rail on the expanse of deck and stair railing. 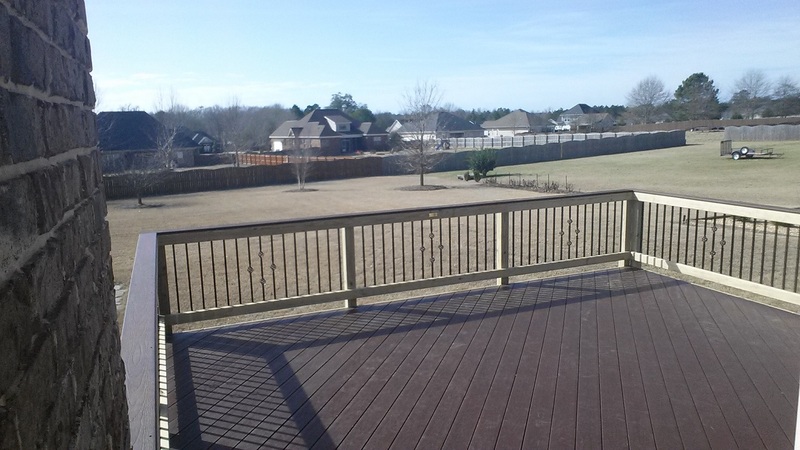 — Expansive TimberTech deck in Bonaire GA with custom deck railing. SEE MORE COMPOSITE DECKS BY ARCHADECK OF CENTRAL GEORGIA! Unfortunately, this deck was not a candidate for redecking, as the structure was found to be inadequate. However, if you are considering a deck expansion, your deck could be a great candidate for redecking. Redecking encompasses tearing existing decking away, reconfigure the deck’s structure to suit the new size and design, add more support where necessary, and re-cover with new decking. Take advantage of Archadeck of Central Georgia’s free deck safety inspection to see if your deck is able to be redecked! If your deck is lacking for space for entertaining and private relaxation, we are ready to help you achieve the new, larger deck of your dreams. Archadeck of Central Georgia is the Macon and Warner Robins area’s premier outdoor structure builder. Give us a call today to schedule a design consultation at 478-745-2000 or via email at [email protected]. 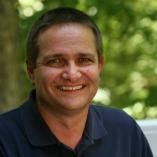 Stephen Denton, owner Archadeck of Central Georgia.